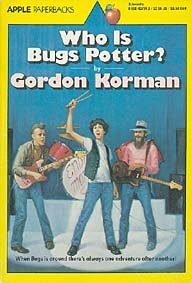 When I was in Junior High I read this great book called "Who is Bugs Potter?" I won't rehash the plot here (although I recommend the book wholeheartedly), but I do remember one character detail in particular. Bugs Potter was always upsetting people with his behavior, and when they tried to call him on it he would cheerfully misunderstand, as if they agreed with him! The book was told from another point of view, so I have no idea if Bugs was an idiot or just the most positive person ever, but I never forgot the way he deflected criticism and negative people. So today (heck; all weekend even), practice being like Bugs Potter. Misunderstand when people say negative things. Pretend they actually agree with you, or are saying something nice. Keep a straight face, and never let on it's an act. If nothing else you will infuriate these negative nabobs, and that's always worth doing. And who knows? You might cheer up others. I read this to my class. They thought it was hilarious as they were never 100% certain what to think of Bugs' character. Funny stuff! Hyperion - ya better recognize! Copyright 2006 - 2014 by Hyperion. Picture Window theme. Powered by Blogger.